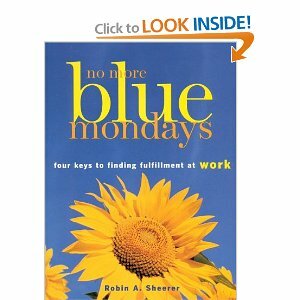 No More Blue Mondays/ Four Keys to Finding Fulfillment at Work won the national Ben Franklin award for best career book of the year in 2000. No More Blue Mondays is a guide to transforming work into an opportunity for self-expression, contribution, and personal growth and development. Unlike the usual career books on how to pursue success to “get ahead,” my book focuses on finding, creating, or designing work that is satisfying and fulfilling. It combines no-nonsense advice with constructive tools that show how to achieve sustained success and happiness at work through the use of four keys which are enduring life principles. It’s full of true stories about past clients. People report they love my book and can hear my voice in it. It represents my philosophy, beliefs, and experience. Happy reading. I hope it will make a difference in your life or in the life of someone you care about or love.